Knives made from powder metallurgy steel are relatively new. The powder metallurgy HSS steel HAP40 manufactured by Hitachi can be hardened up to between 64 and 68 HRC. Although Japanese knife manufacturers tend to be pretty traditional, and rarely make changes without a very good reason, they are open to new materials or processes if they represent a substantial advance in quality or ease of use for their customers. But only then will a venerable company like GIHEI, based in Sanjo, Niigata Province, change its long-established methods. 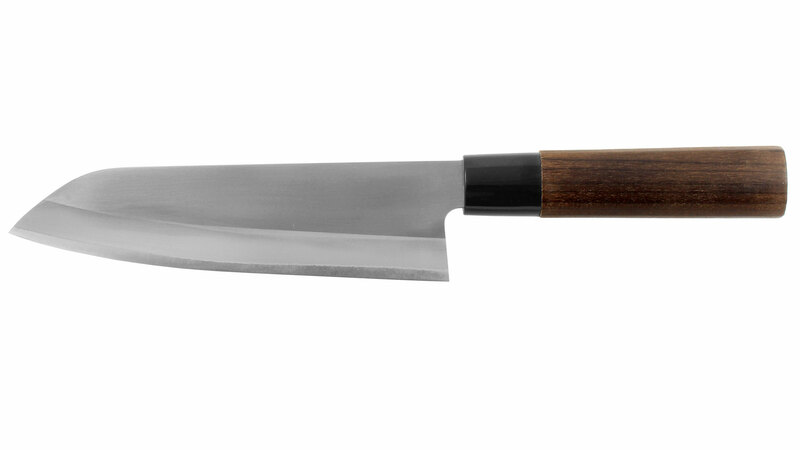 GIHEI, established in 1928, has specialized from the outset in the production of Nakiri-type (three-laminate knives) kitchen knives - either as Santoku, Kakugata or Kengata (also Gyuto or Gyutu) were made. 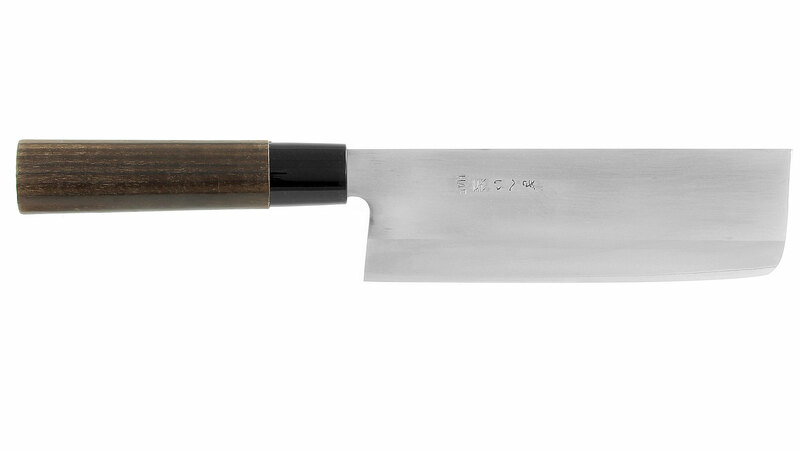 These knives were manufactured in the traditional way, and GIHEI has a good reputation. The goal of the current owner Atsushi Hosokawa has been to preserve the outstanding characteristics of Japanese knives, like high sharpness, hardness and ease of sharpening, but to work on some of the admitted disadvantages, such as the relatively brittle edge and susceptibility to rust so that a more "ideal" knife is developed - with all the positive characteristics retained and the disadvantages minimized. Many years of experiments led to the decision to use a powder metallurgy steel, HAP40 from Hitachi. HAP40 is fine-grained enough to sharpen very well and rates 64 - 68 on the Rockwell Hardness Test (HRC) - even harder than the traditional carbon steels used for knives. Contrary to other HSS steels, it can be relatively easily sharpened on normal waterstones, if not quite as easily as traditional steels. 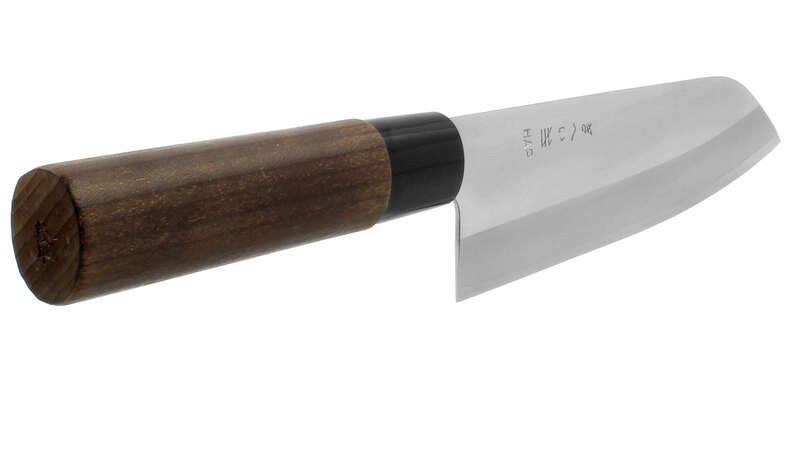 Knives from this steel keep their sharpness 3 to 5 times longer than traditional knives. 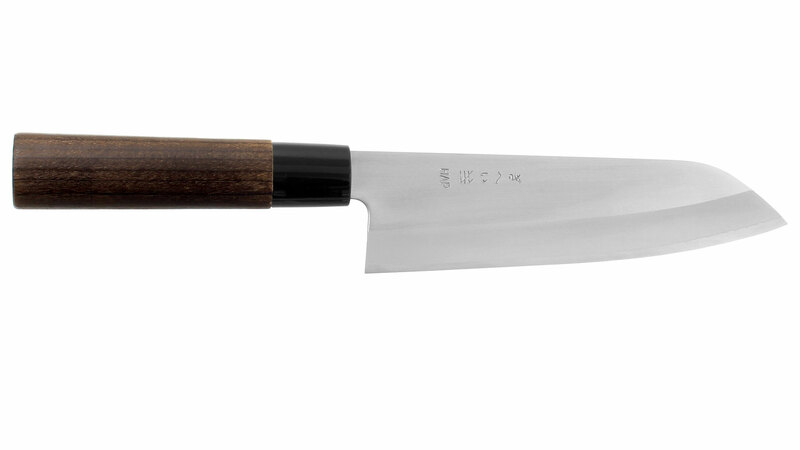 HAP40 is extremely tough, and so not as likely to chip along the edge as the steel used in traditional knives. The knives are manufactured in three layers, HAP40 is used only in the "Hagane" or middle layer, that becomes the cutting edge. The use of the stainless steel grade SUS405 for the "Jigane", or the two outside laminates, solves the rust problem elegantly. All knives illustrated on this page are made of three-laminate steel. Do not put these knives into the dishwasher! After use, wash off and dry - stainless steel can rust if left wet for long periods. Never cut deep-frozen meat or vegetables! These knives are intended for cutting vegetable and meat. They are not designed to cut bones in meat, poultry, or fish! With the knives made with smoked Magnolia wood grips, illustrated below, the blades are made of industrially produced laminated blade blanks. These knives are provided with a black plastic ferrule. The knives with natural colour Magnolia wood grips were individually forged by hand in GIHEI's smithy using a proprietary process. Therefore, the reason for the price differences is clear. 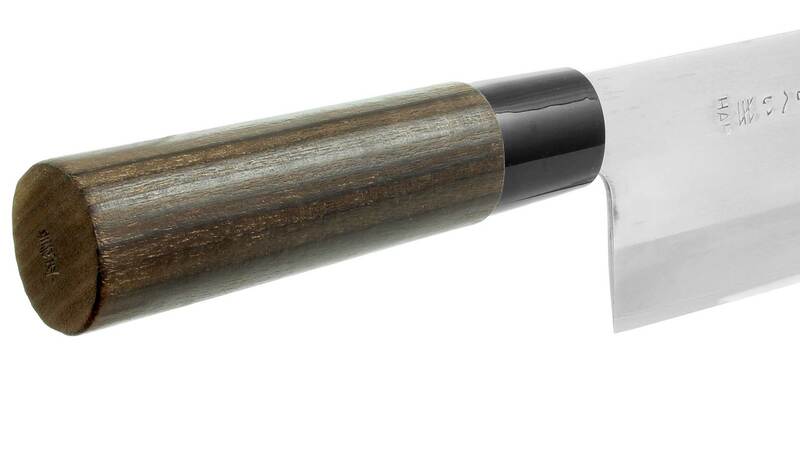 These hand-forged knives are provided with a ferrule made of water buffalo horn. The producer considers this knife, with its traditional form, and high-tech materials and performance, to be close to the ideal the manufacturer has been looking for, and so gave the line a name: "KAZAHANA", which means "snow dancing in the wind". 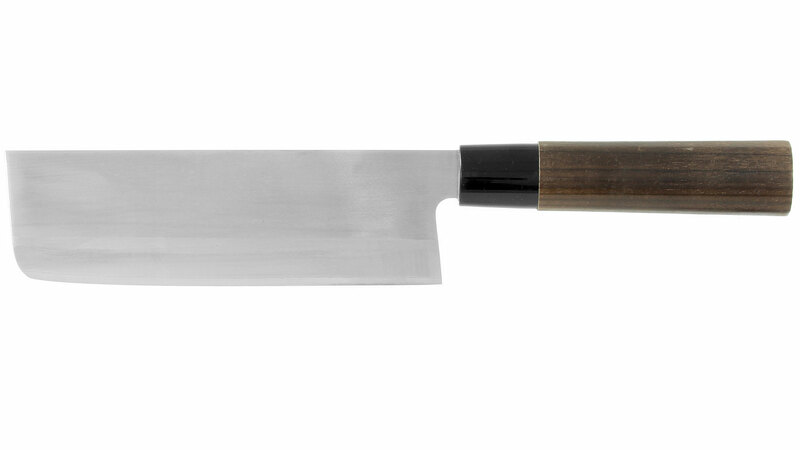 Atsushi Hosokawa recommends Shapton-Stones to sharpen these knives. Any other Japanese water stone will do the job, but they work slower with this steel. See Atsushi Hosokawa and Takashi Hosokawa at work! 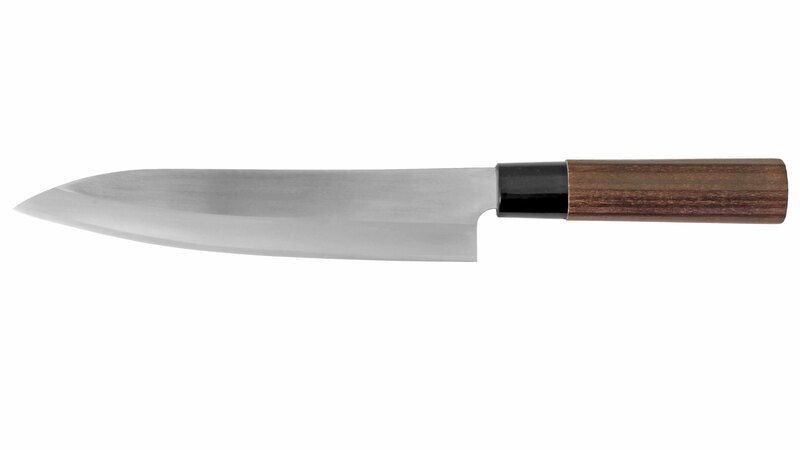 KAZAHANA Kakugata Hocho - Vegetable Knife The knives with natural colour Magnolia wood grips were individually forged by hand in GIHEI's smithy using a proprietary process. These hand-forged knives are provided with a ferrule made of water buffalo horn. 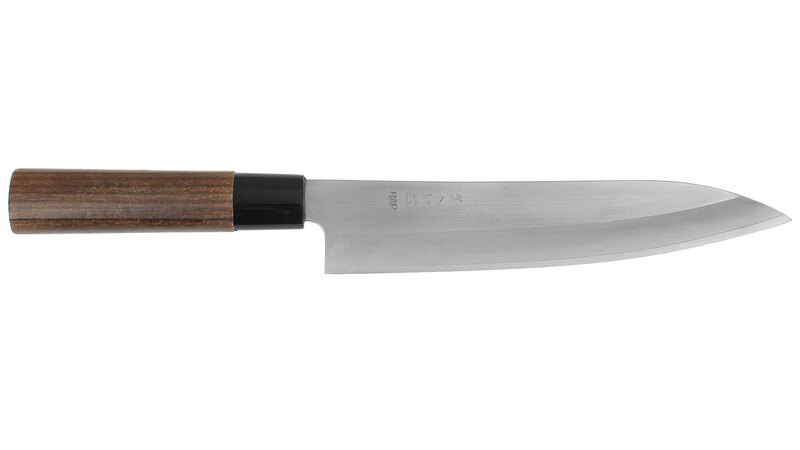 KAZAHANA Gyuto Hocho - Slim All Purpose Knife The knives with natural colour Magnolia wood grips were individually forged by hand in GIHEI's smithy using a proprietary process. 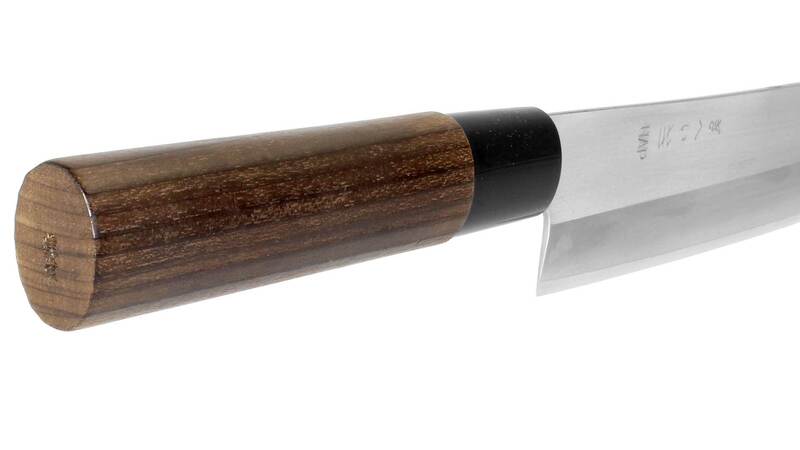 These hand-forged knives are provided with a ferrule made of water buffalo horn.